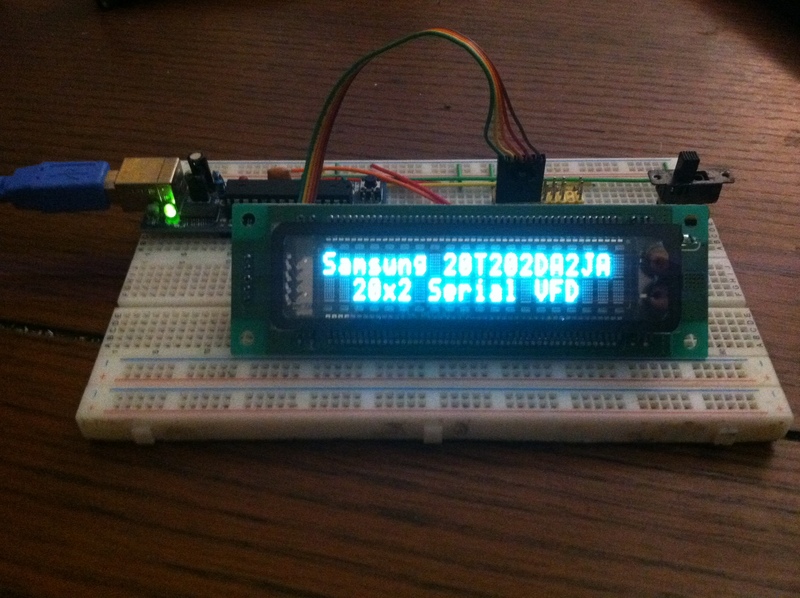 VFDuino is a sketch designed to control a Samsung 20T202DA2JA 2x20 VFD using LCD Smartie or other Matrix Orbital compatible applications. The sketch comes with IR Remote (for keypad input) and GPO control. First the appropriate libraries must be loaded. Arduino comes with the SPI.h library, the IRremote.h library (linked in the downloads section) must be added to the Arduino libraries directory to compile in IR Remote support. Next we define the hardware pins that will be used with this sketch. Arduino Uno uses pins 11, 12, and 13 for SPI communication, pin 10 can be mapped elsewhere and is required to indicate we wish to speak with the VFD. Next we initialize the IR Remote library and setup a variable that will contain the last/current IR code received. Lastly the lastPress variable is setup to contain the time of the last IR code received, this is used to create a delay for sending the next keypress code over the serial connection. The firstCommand variable tracks if there has been a command sent over serial to the sketch. When the first command is received the sketch clears the screen and resets the cursor position. The flowControl variable holds the current position of the cursor, this is used to set the cursor to the 2nd line of the screen when the 21st character in an unbroken (non cursor shifted) stream. Using a char array stored in flash memory using the PROGMEM directive means hundreds of screens can be defined without consuming any additional RAM. 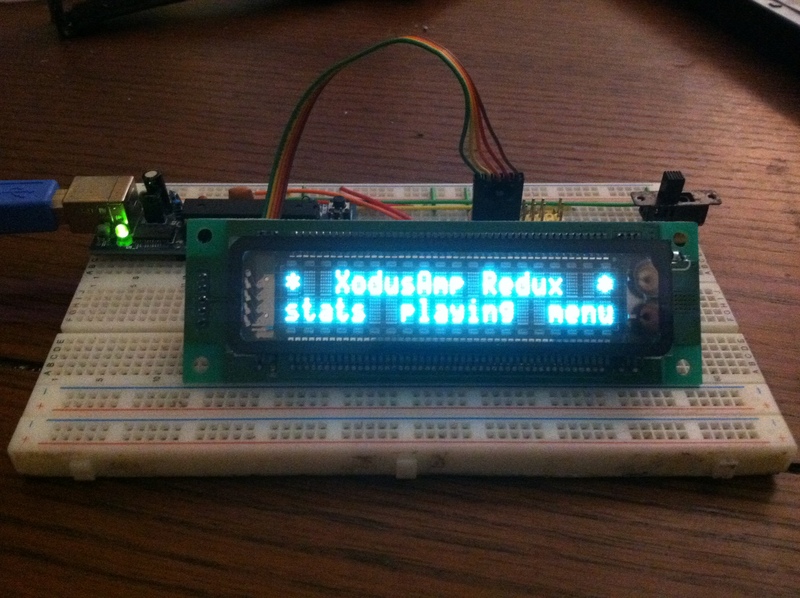 A simple function takes this data from flash and copies it into RAM one byte at a time and displays it on the screen. First serial is enabled at 9600 baud, next the IR receiver is enabled, and we call the vfdInitialize() function to setup the VFD screen. Lastly we call the vfdDisplayScreen() function to display the first screen on the VFD. For the uninitiated the loop() function gets called over and over again once the setup() function finishes as long as the microcontroller has power or is otherwise uninterrupted. Using non-blocking functions in this loop allows us to create a sort of multi-tasking on a device that is single threaded. Two functions are called here vfdProcess() which processes any pending commands for the screen, and remoteProcess() which processes any pending IR codes. Other non-blocking functions can be placed here making it possible to integrate other sketches with the VFD and IR functions. vfdInitialize() is used to setup the SPI connection to the VFD screen and then send the proper initialization commands to the VFD, these are necessary as the VFD won't display anything until sent. vfdDisplayScreen() accepts as a parameter the number of the screen you wish to display, index starts at 1. This function uses the built in Arduino function pgm_read_byte() to read one byte of flash from a particular memory address. In this case screens is a pointer to the flash memory address containing its data. vfdCommand() accepts as a parameter one byte of data to send to the VFD preceded by the byte 0xf8 signaling a command to the VFD screen. vfdData() accepts as a parameter one byte of data to send to the VFD preceded by the byte 0xfa signalling that this is data, normally this is a character to display on the screen however when used with other screen commands can contain custom character data for example. vfdProcess() is called continuously by loop() and determines if there is pending data for the screen and calls the command and data functions for the VFD. vfdProcessCommand() reads incoming data from serial and maps to the appropriate command/function for the VFD, the command set above emulates a matrix orbital serial display and reports as a 2x20 matrix orbital VFD. Not every command was necessary to make this compatible with the LCD Smartie matrix.dll driver though care is taken to properly escape the extra parameters these commands may use, otherwise this may generate junk data on the screen. vfdProcessData() takes as a parameter one byte of data, the VFD's character map differs from standard ascii and some characters need to be mapped to their proper address in the VFD's character map. serialGet() pauses the current program execution until there is data available from serial, the first available byte is returned. Arduino VFDuino was created by Travis Brown, email: WarriorRocker@gmail.com.